I definitely love a good charcuterie board. That being said, I don't eat any pork, so finding patés and mousse that is made without pork products can be daunting. 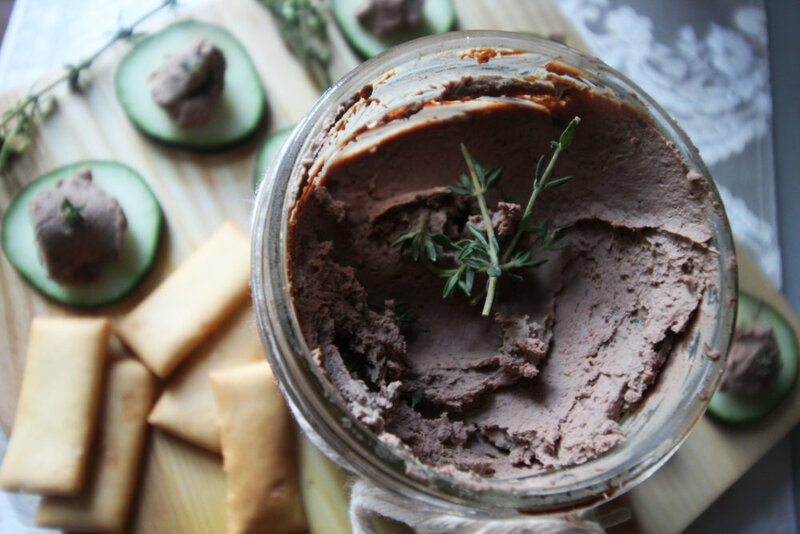 I originally found a recipe for chicken liver mousse from New York Times, and have edited it. This recipes makes enough for a crowd. It's perfect for the holidays! Season livers with a liberal amount of salt and pepper and the thyme leaves. Warm a large sauté pan over medium heat with the vegetable oil. Brown the livers on both sides and add the sliced red onion. Sear the livers on the other side for about 2 minutes. Add the lemon juice and brandy, cook the livers until the pan is dry. In a blender (I use a vitamix), add the livers and blend. Slowly add the heavy cream and then the cubes of butter. Blend until smooth. Place into a large mason jar and serve with crackers, crostini, or cucumber slices.